The Bone deformation allows you to create a skeleton structure in which the parent bone moves the child bone. 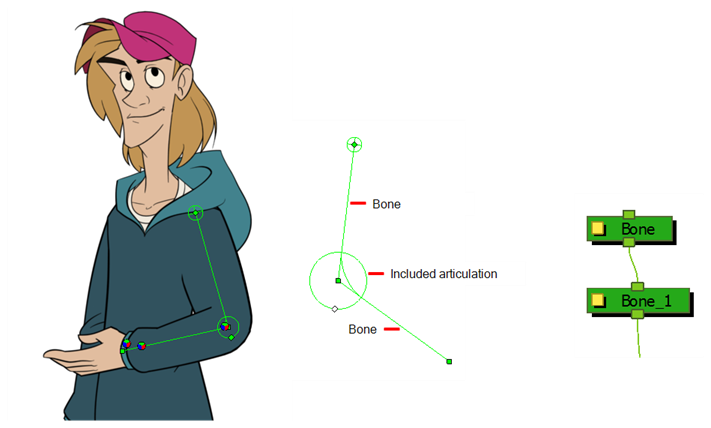 The Bone deformation is useful when animating the extremities of a character, such as the arms or legs, adding fluidity and a natural feel to the animation. It can be manipulated to rotate a limb at an articulation joint and to shorten or elongate the extremities of a limb. It's also quite handy for bending the torso. NOTE: If you are creating a rig to be used in a game, use the Game Bone deformation.